Puerto Rico Marks 60th Anniversary of Jayuya Uprising | Democracy Now! Democracy Now! co-host and New York Daily News columnist. AMY GOODMAN: Tomorrow, October 30th, is the sixtieth anniversary of the 1950 independence revolt in Puerto Rico by the island’s Nationalist Party. It marked the most significant attempt at armed revolution in Puerto Rico since the late nineteenth century. Juan, you’ve been writing a lot about this uprising. Can you talk about its significance? JUAN GONZALEZ: Well, I’ve written in the past about it, and I think that the — it is a little-known incident, really, in US history or the history of the United States empire, but it really remains one of the defining moments in the island of Puerto Rico’s history. It was back —- actually, the events leading up to it are important to understand, that in 19—- this is in the post-World War II period, as many of the countries that were coming out of World War II were forced by the events of having to win the war, World War II, against the Nazis, to begin granting independence or autonomy to their colonies — England to the Commonwealth, to India and all of its other colonies; France to its overseas colonies; and the United States attempted after World War II to claim that Puerto Rico had been granted autonomy. And in 1948, the first Puerto Rican elected governor, Muñoz Marín, comes into power, but the island is still ruled by the United States and by Congress and is militarily occupied, so that the Nationalist Party was part of this anti-colonial movement of the ’40s and ’50s. And on October 30th, 1950, the Nationalists rise up against the United States in a planned insurrection. It actually started a couple of nights before, in the morning of October 27th, when some Puerto Rican police intercept a caravan of Nationalists, including the Nationalist leader, Pedro Albizu Campos, and arrest some of them. And the Nationalists immediately decide it’s time to revolt, because that summer, in July of 1950, Congress had passed what’s known as Law 600, which was, in essence, ordering that the Puerto Rican people have a referendum on a new constitution. And that referendum was to take place the following year, and voter registration for that referendum was to begin on November 4th and 5th of 1950. So the Nationalists saw this referendum as illegitimate, and they began the uprising first with a planned prison uprising in the main prison in Puerto Rico, La Princesa, as a hundred inmates broke free from the prison, and then with revolts in about eight cities in Puerto Rico, including the town of Jayuya, which was the main center. That’s why it’s called the Revolt of Jayuya. And at the time, the Puerto Rican government had already adopted a law to muzzle the Nationalists. It was called the Gag Law of 1948, which made it a crime to even advocate independence or the overthrow of US rule in Puerto Rico. And so, as a result, the governor, Marín, Muñoz Marín, called in the National Guard. Two towns were bombed by the National Guard: Jayuya and Utuado. The Nationalists attacked the governor’s mansion. They burned down a couple of police precincts. And eventually, about twenty-five people were killed. And perhaps the most important incident, that the rest of the world knows, is that since communication was cut off from the island, very few people in the United States knew what was going on. A couple of Nationalists in New York City decided to make an armed attack to attempt to assassinate President Truman — Oscar Collazo and Griselio Torresola — on November 1st, shortly after the revolt began, went — traveled to Washington and attempted to shoot Truman at the Blair House. It was a bungled attempt on their part, amateurish to some degree. And Torresola was killed. A police officer was killed. And, of course, Oscar Collazo was captured and eventually spent about twenty-five years in prison. The revolt was a failure, in terms of being able to achieve Puerto Rican independence. And Muñoz Marín tried to play it down as just a few extremists. But because of the attempt on Truman’s life, mass arrests occurred over the next few days on the island. Between a thousand, two thousand people were arrested. Anybody who had any kind of political leanings toward independence or was seen as a leader was thrown into jail. And for years afterwards, it was impossible for supporters of independence to get jobs in the government. It really was an enormous repression and crackdown that occurred in the years following. Albizu Campos, himself, the Nationalist leader, was involved first in a standoff in his own home in San Juan, before he was arrested and sent back to prison. He had already spent ten years in federal prison for conspiracy to overthrow the American government. He’s sent back to prison now and pretty much stayed in prison or in a hospital between 1950 and 1965, when he died. So that the revolt failed to achieve Puerto Rican independence, but sixty years later, there’s still a legacy of that revolt that people really are not aware of. The fact is that Albizu Campos and the Nationalist Party represented, one, an affirmation of Puerto Rican nationhood. 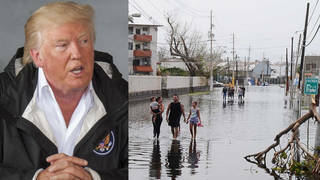 The reality is that today — what are we, 112 years after the United States occupied Puerto Rico — the Puerto Rican people still speak Spanish as their language in their public schools, even though they are United States citizens, they still conduct their courts in the Spanish language, and they still have a firm sense of their nationhood and of their existence as a people. While they are United States citizens, they still see themselves as a people, and there’s still an enormous sense of nationhood in Puerto Rico, and even among those who support statehood for the island. So I think the legacy of the Nationalists sixty years later is that there’s still a Puerto Rican nation, that, while not independent, remains a people that see themselves distinct from the colonial power that still rules over the island. And I think that that is the biggest — the biggest legacy of the Nationalist Party still to this day, even though the revolt has long been forgotten by most people in the United States, certainly not in Puerto Rico. AMY GOODMAN: Well, Juan, thank you very much. And your book, Harvest of Empire, is a very important history of Latinos in the United States and should be read by everyone. JUAN GONZALEZ: Well, and also, I think one of the best histories of this whole period, unfortunately, has never been translated into English. It was written by historian Ivonne Acosta. It’s called La Mordaza, The Gag. And it is really the legal history of what happened in that period of time, and I recommend it. For those of you who read Spanish, you’ll have to find a copy.